Cable ties and a wire rack are all you need to copy this brilliant kitchen storage idea – LAB Recipes! There are two things you can never get enough of in the kitchen: dessert and space. While I can’t help you with the first one, I can give you some advice about gaining more kitchen space without spending a bunch of money. Most of these hacks can be done with a little woodworking ability, a bit of organizing prowess and a few trips to the dollar store. So if you’re ready to take back the crowded spaces of your kitchen, just try out a few (or all) of these tips! 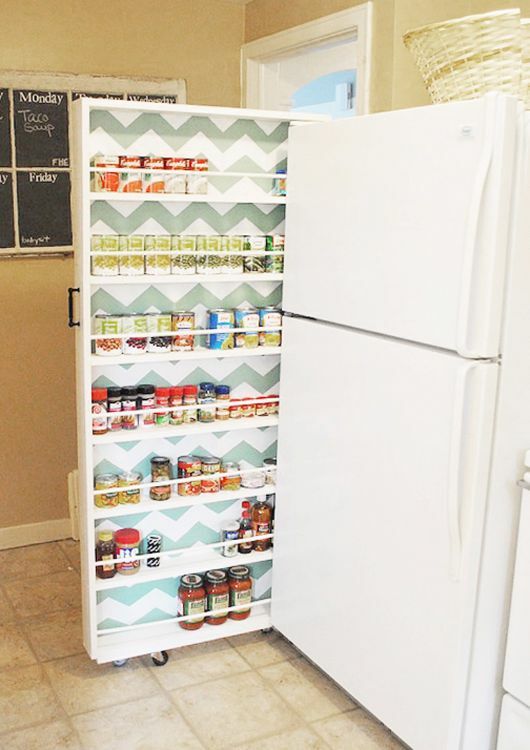 If someone in your household is willing to test out his or her carpentry skills, then give this canned goods storage shelf a try. You can adjust the sizes to fit your kitchen and make it small enough to fit in some of the narrow spaces that can’t be used for anything else. You don’t want to leave sponges and soap dispensers around the sink for two reasons: 1. They take up too much space and look tacky; 2. They won’t dry properly and can start to grow mold. 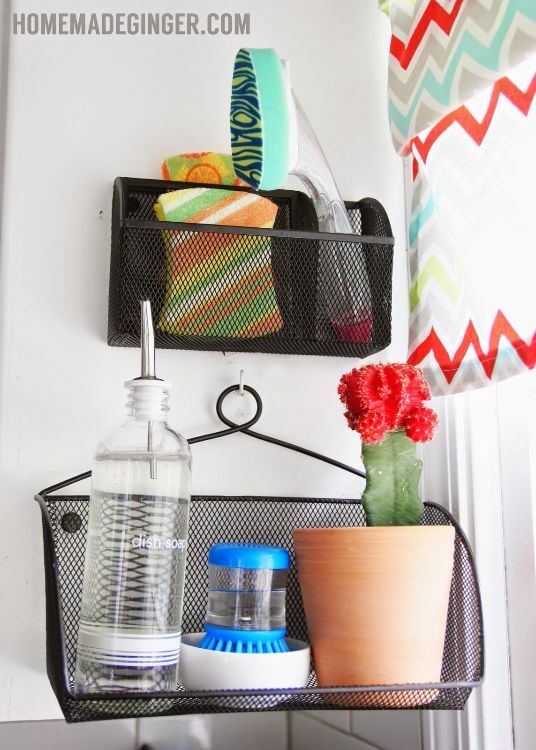 Clean up the area around your sink by hanging some desk organizers on one of your cabinets and placing sink-related items in them. To save even more space in your kitchen, utilize the undersides of your shelves. 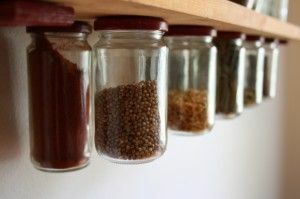 Just screw the lids of mason jars to the bottoms of your shelves, fill the jars with whatever items you can fit in them and match them up with their lids. If you don’t want to screw the jars to the shelf, you can use magnets, but there’s always the chance that the magnet won’t be strong enough if the jar is too heavy. Even though they aren’t very big, lids still tend to take up a lot of space. They have handles on top, so you can’t stack them and putting them on top of their respective pots just means you can’t store smaller dishes inside your larger pots. 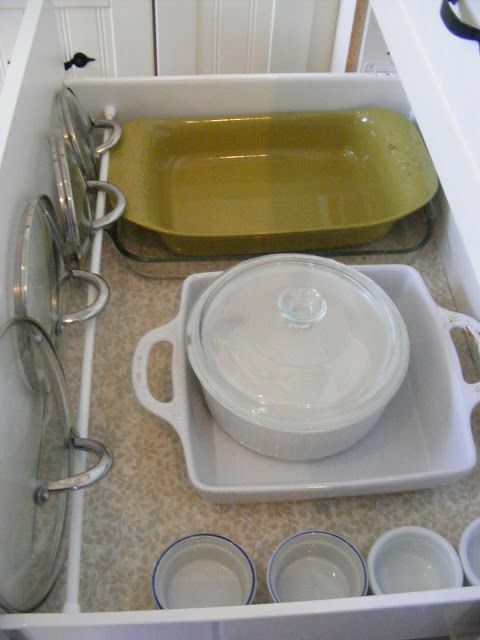 Solve this problem by installing a small tension rod across the front of the drawer and placing your pots between the drawer and the rod. Cutting boards also take up more space than you would assume considering how thin they usually are. But, you don’t want to just leave them out on the counter and you can’t really cram anything else into your cupboards or drawers. When it seems you’ve run out of room everywhere else, attach a wire rack to the inside of a cupboard door to hold your cutting boards. Some people take advantage of pantry shelves and just shove everything in there with absolutely no form of organization whatsoever. But if you’re trying to save space, this is the worst way to store your food and other kitchen items. Instead, buy some cute baskets and fill them with similar items to make everything easier to find. If you’re feeling extra motivated, you can even label the various baskets. 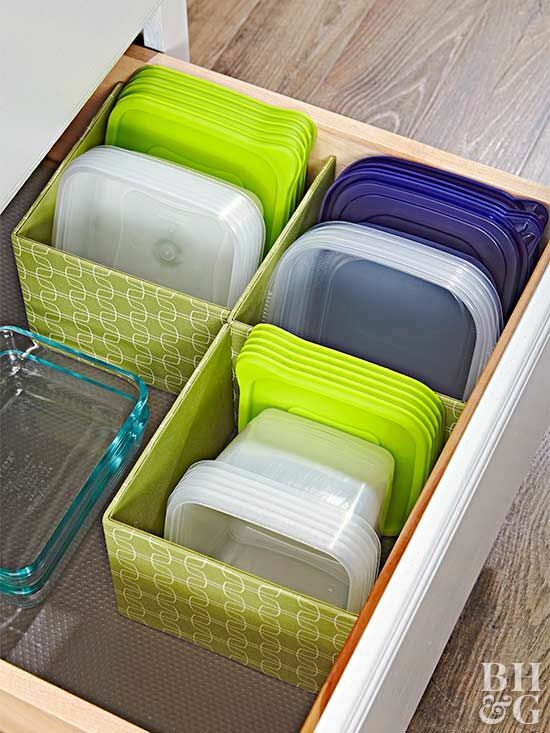 If you have an abundance of Tupperware filling every inch of your cabinets, then it’s time to reign it in. Put some book bins or other similarly sized boxes in a drawer. Then gather all of your Tupperware (and the matching lids) and stack the containers in these boxes. The cupboard below your sink is perfect for storage, but only if you utilize the space properly. Don’t just shove odds and ends under there and hope they don’t all fall out every time you open the door. Instead, use pull-out doors to organize your items and keep them out of the way until you need them. Measuring cups and spoons are fairly small and easy to stack inside of each other. Despite this, they still take up more than their share of shelf space. 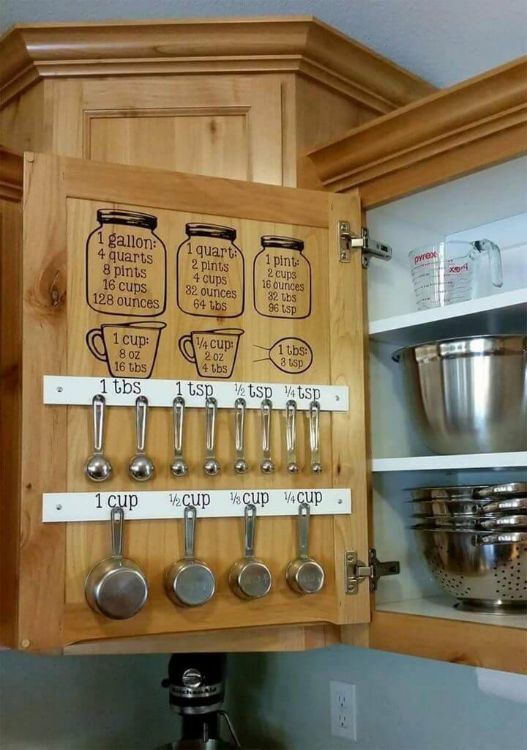 Free up a few inches here and there by hanging your measuring utensils on the inside of a cupboard door. You can even get creative and add a measuring chart above them. 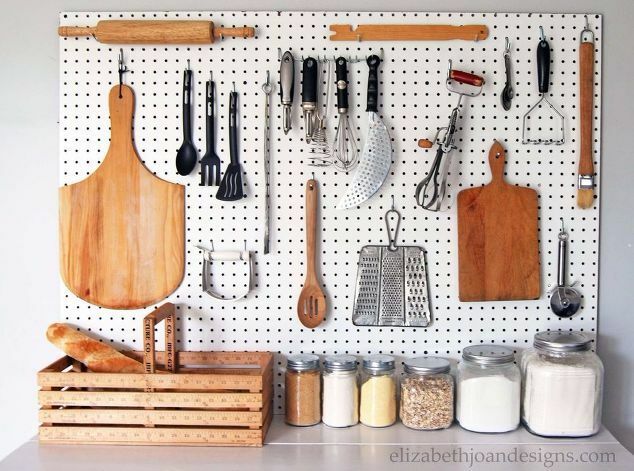 If you have blank wall space in your kitchen, you might consider setting up a pegboard. 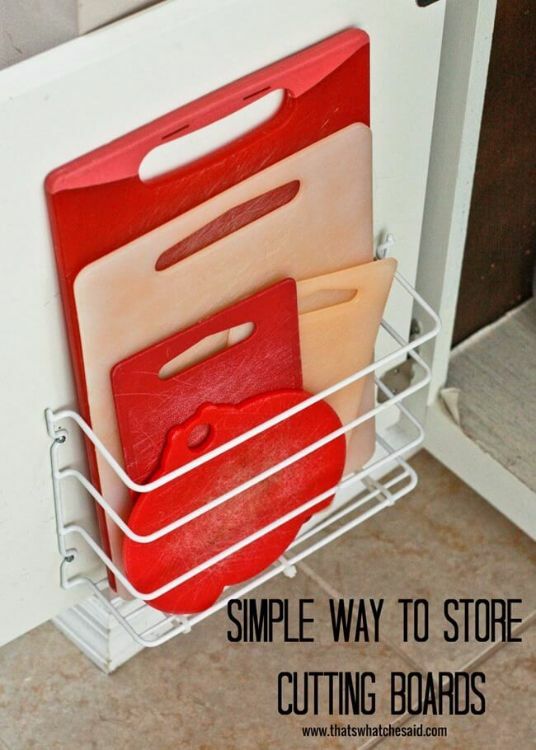 You can hang just about anything on there, from utensils to cutting boards to the items that don’t seem to fit anywhere else. With these tips in mind, you’ll have your kitchen completely organized in no time! But before you get started, make sure you share this list with your friends on Facebook so they can also learn to properly utilize the space in their kitchens.